PITTSBURGH, June 27, 2018 – Several states are likely dramatically underestimating the effect of opioid-related deaths because of incomplete death certificate reporting, with Pennsylvania leading the pack, according to a new analysis by the University of Pittsburgh Graduate School of Public Health. The study, published today in Public Health Reports, the journal of the Office of the U.S. Surgeon General, found that potentially 70,000 opioid-related overdose deaths were not included in national opioid-related mortality estimates since 1999 because coroners and medical examiners did not specify the drug that contributed to the cause of death when completing the death certificates. "Proper allocation of resources for the opioid epidemic depends on understanding the magnitude of the problem," said lead author Jeanine M. Buchanich, Ph.D., research associate professor in Pitt Public Health's Department of Biostatistics. "Incomplete death certificate reporting hampers the efforts of lawmakers, treatment specialists and public health officials. And the large differences we found between states in the completeness of opioid-related overdose mortality reporting makes it more difficult to identify geographic regions most at risk." In the U.S., cause of death codes are assigned by the National Center for Health Statistics (NCHS) using information reported by the coroner or medical examiner completing the death certificate. Drug-specific overdose deaths are identified by the contributory causes of death, which are categorized as "T codes" and are assigned based on the specific drugs recorded by the coroner or medical examiner completing the death certificate. A code of T50.9 means "other and unspecified drugs, medicaments and biological substances." Buchanich and her team extracted death data by state for 1999 through 2015 from the NCHS's Mortality Multiple Cause Micro-data Files. They grouped overdose deaths into opioid-related, non-opioid-related and unspecified codes, and calculated the change in percentage of overdose deaths that fell into each category from 1999 to 2015 by state. This allowed the researchers to extrapolate how many of the unspecified overdose deaths were likely opioid-related. The variability among states not reporting specific drugs during this time period was tremendous – ranging from fewer than 10 unspecified overdose deaths in Vermont to 11,152 in Pennsylvania. 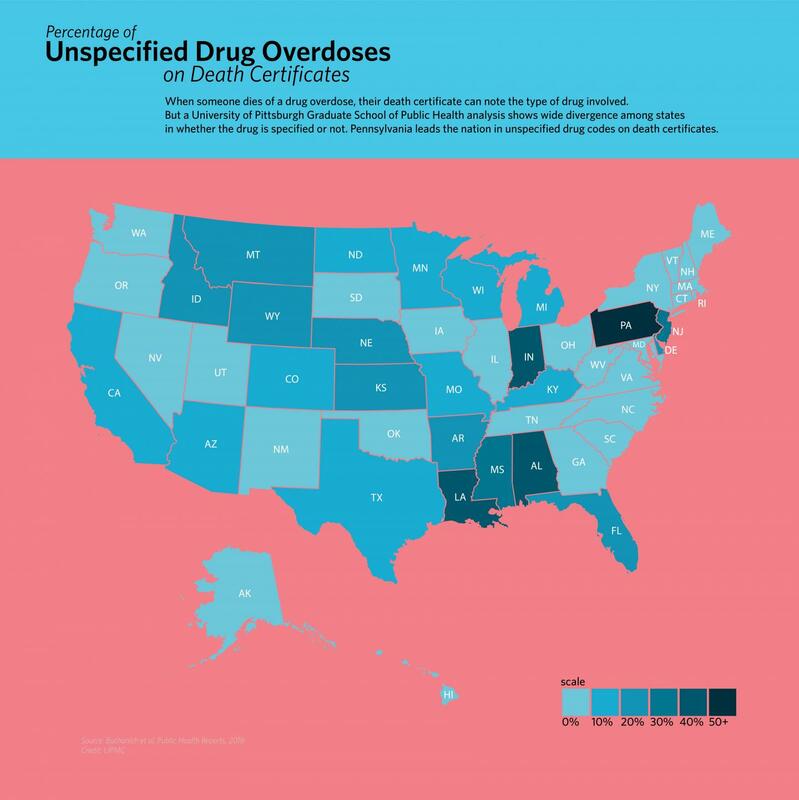 States with a decentralized county coroner system or with a hybrid system that involved county coroners and state medical examiners, were likely to have a higher proportion of overdose deaths with unspecified drug codes. "Multiple organizations have advocated for more accurate drug reporting on death certificates," said Buchanich. "But coroners are less likely to be physicians and do not necessarily have medical training useful for completing drug information for death certificates based on toxicology reports. And states with a decentralized or hybrid system are likely to have less standardization, leading to greater variation in reporting accuracy." Several states have made extensive efforts to improve reporting. In Kentucky, for example, opioid-related drug codes increased 43 percent from 1999 through 2015, and unspecified drug reporting decreased 28 percent. This suggests that state-based efforts can be instrumental in improving the accuracy of drug-specific reporting for overdose deaths, Buchanich said. Several assumptions – primarily that the proportion of known opioid-related deaths would be the same for those that were unspecified by state by year – were made in performing this analysis, Buchanich said. Future research should more fully evaluate these assumptions and also examine other factors, such as potential biases, that could lead coroners and medical examiners to use an unspecified versus specific drug code on death certificates. Donald S. Burke, M.D., dean of Pitt Public Health, was senior author on this research. Co-authors are Lauran C. Balmert, Ph.D., who was at Pitt at the time of the research and is now an assistant professor at Northwestern University, and Karl E. Williams, M.D., M.P.H., chief medical examiner of Allegheny County.